Traveling to see the world is a lot of fun, but this is not my main reason for doing so. My wife and I truly enjoy experiencing different parts of the country and if that were our only reason to travel then I'm sure we'd do that. However our biggest reason for gallivanting about North America is to see people--friends, family, and most of all, grandchildren. In the photo above you see my wife and I on the boardwalk along the beach at Asbury Park, NJ with four of our grandkids. I had donned my A to Z 2016 tee shirt to parade up and down the Asbury Park boardwalk with my family. Unfortunately our plans were sidetracked by a massive thunderstorm that came along and caused us to make an early retreat to the sushi restaurant where one of our daughter's husband works. Since that had been part of the plan then that was okay even though we had to spend more time at the restaurant than we had anticipated. The oldest of the grandchildren was around the corner from the restaurant at "rock and roll school" which is the prestigious Lakehouse Music Academy. Marley, who will soon be eight, has been taking a regimen of various music classes geared toward learning the skills of singing and playing instruments as well as practical experience in performing. Their recitals take place at the famous concert venue The Stone Pony which is where many famed artists such as Bruce Springsteen and Bon Jovi got their starts and which showcases many well known and lesser known acts throughout the year. Not a bad place for a kid (or anyone for that matter) to hone their chops for a potential future career in music. My daughters and their spouses along with all five grandchildren. A number of years ago I would never have expected that I'd be eventually making so many trips to New Jersey, but then one daughter moved there and then the next until three were living there. The other moved to Houston, Texas which makes for a bigger circle of travel when we set out to see everyone. With our girls and their families so far away from us out here in Los Angeles we feel the obligation to make massive road trips just for those few precious days each year when we can spend time with all of them. Maybe after my wife retires the situation can be changed, but for now what have what we have. After I moved to Los Angeles from East Tennessee, I made it a point to try to come back at least once a year to visit my mother and my siblings who still lived there. My mother passed away in 2014, but going back to Tennessee still seems like a necessary ritual for me. My brothers and sisters still live in that beautiful part of the country and we have such a darn good time when we all get together. If I'm going back east anyway, then it just seems like the natural thing to pay a visit to East Tennessee. After all, millions of vacationers go to that part of the country every year because there's so much to see and do in that area. When we go, we try to get out and around, but mostly we just hang around and talk and enjoy the wonderful summer evenings in Tennessee. This year we did take a couple of day trips around nearby counties and into neighboring Georgia and North Carolina. As usual I forgot to take photos most of the time, however I did manage some shots at a Bible based attraction called Fields of the Wood outside of Murphy, North Carolina. We'd already had a full day by the time we'd gotten there and since it was getting late we didn't stay long. Just long enough to take a few photos and then move on down the road. In the above photo you see my sister-in-law Hallie, my brother Jay, me and my wife, and my sisters Joni and Joy. We are posing in front of what is likely the world's largest depiction of the Ten Commandments which are written on the side of a mountain. There was so much to see at this park that we didn't have time to take it all in. This is one of those places that I want to go back to visit one day. After driving to the top of the Ten Commandments mountain, my wife and I posed for one more photo. Take note that I once again wore my A to Z shirt to be a walking billboard for the event. Be watching the Blogging from A to Z Challenge Blog for news. We've slacked off on that site during the summer, but activity will be stirring soon. You won't want to miss some important announcements that are to come. Also, I have what I think is an interesting Battle of the Bands post scheduled for this coming Thursday September 1st. Might be musically educational to you and I hope some fun. It's a song about hair, but it has nothing to do with the musical Hair. In fact on first hearing the song you might never even guess it was about "hair". Do you travel to visit family? What is your ideal vacation? Any idea about the song I'll be using for my next Battle of the Bands entry? Wonderful photo's of your family and so interesting to read. I still haven't forgotten that day in LA. Thanks to you a wonderful day to remember. Yvonne, yes, your visit to L.A. was memorable to me as well. Glad we were able to meet on that day. Hilary, hope I have many more years of travel ahead. It's a rewarding experience and just fun to get away sometimes. I guess I need to trek over to Murphy sometime. When your wife retires, you do need to think about moving this direction. You'll be closer to family and cost of living will be so much cheaper. Alex, moving is always on my mind. If our ability to travel becomes more limited, those cross country trips may not be as easy to do in the future. Moving closer would make the logistics easier. Holy moly, that Ten Commandments is huge. It didn't look very big to me until I looked down from where you're all standing and saw the cars. Nasreen, the Commandments are literally on the side of a mountain. It's impressive. A great reason to travel indeed. Nothing wrong with being a walking billboard too haha all family here lives close, so at most 2 hours of travel for me to see. Pat, I don't mind being a walking billboard as long as I'm not perceived to be as big as a billboard. You have a beautiful family! I wouldn't mind taking shelter in a sushi restaurant, I love love sushi. We have a son in Houston, and all the rest of our kids are in Western states. Makes it easy to see them! Karen JG, since it's a nice sushi restaurant with a lot of other choices besides sushi then it was a place with something for everyone in our crew. Getting family in closer proximity is a big plus. Awesome possum! I drive 150 miles every other weekend to see my grandbabies. Shelly, 150 miles is a breeze--2 or 3 hours makes for a nice little drive and you're there in no time. I would be happy with that distance. Debbie D, I do look forward to my road trips, but then I'm kind of a road warrior anyway. Road trips are ingrained in me. Most of our immediate family is located in North Carolina plus Maryland. Since we are in upstate NY, we can only schedule visits during Christmas and summer. My ideal vacation would feature hiking and waterfalls, something outside. Tamara, a mountain vacation with hiking would be my preference as well. As long as I get to see my grandkids more often. I've been to East Tennessee many times, especially when I was attending Western Carolina University. Such a lovely state. Dixie, E.Tennessee is a wonderful place, but Western NC is not bad either since it's very similar geographically speaking. Oh my GOODNESS, your entire family is so beautiful. And those grandkids. it sure looks like you had a great time. Teresa, those are times that I hate to see end. If we lived closer there could be more times together and that would be nice. Wonderful pictures, Lee! I smile just looking at all of the happy faces. I wear my A-Z Challenge Survivor t-shirt everywhere too! Diedre, I don't wear my A to Z shirt when I'm just hanging around the house which is where I usually am. No, the song is nothing close to those and might be a bit unfair unless you are familiar with a certain kind of music. Those are some beautiful children you have there. I don't blame you for wanting to see them! 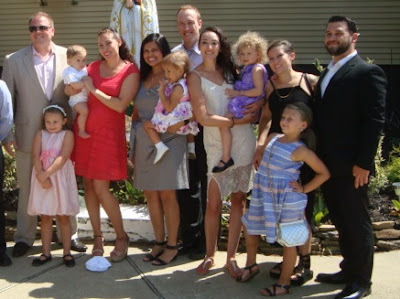 Of the eight of us, I am the only one who did not have kids and who does not live in Pennsylvania so if I want to visit family, I have to travel. Kathleen, my daughters are all beautiful, smart, and talented and it looks like the grandkids are going to follow in their footsteps. I know some people who are glad to be away from their families so they are happy to live far. When you have kids it becomes an entirely different situation--for most parents at least. You have to be very proud of that lovely bunch of kids and grandkids! Thanks for sharing! CW, I am very proud of the whole bunch of them. I don't like my family so if I could travel it'd be to get away from them. I love my husband's family and kids, just not mine. My ideal vacation would be traveling all of north america in an RV. JoJo, too bad that you don't like your own family, but it's nice to have the surrogate family through your husband though I guess you can call them your family now. Dezmond, family is such a blessing to me. I'm sad to hear when some people don't have those same wonderful family ties, but I guess we find compensation for those things we don't have. Susan S, surprising that hair styles would still be a controversy in our time, but I guess a private school can dictate the rules they want. A 1000 mile road trip is not too bad though it's a distance that I'd prefer to do in 2 days with an overnight stay along the way. Tommy Z, a cross country trip with small kids is doable and maybe something you should consider one day. It can be an exciting and memorable experience for the kids. When my family moved from San Diego to Indiana in 1963, I was 12 and Joy was 11 and the other 3 kids were all 4 years or less. No AC in the car then either. All of my recent travels have been to visit family, especially my mom who's 97. I'm about to move her from Illinois to Colorado so I can see her more often. My husband and I traveled so much when we were first retired that I don't feel I've missed anything. Seeing family is lots more fun than seeing the sites anyway. Patricia, the sites are fine, but family is hard to beat. Besides, the sites will be there to see later, but kids grow up and family members can leave us so it's important to spend time with them while we can. The move for your mom will be a major one. I wish you all well with that. That is simply the best reason to travel, family. When I travel, it's all about visiting family. I haven't taken an adventure vacation in YEARS...and I'm talking many years. But I treasure each and every visit with family as those are precious times. I enjoyed seeing your family in the photos. Thanks for sharing them! What an amazing presentation of the Ten Commandments. You don't realize how big it really is until you see the cars in the parking lot at the bottom of it. Very impressive! Tennessee is one of the most beautiful states I've ever traveled through. Simply gorgeous! Michele, even travel to see family can be filled with adventure and it's almost always fun. I can look in books and magazines to see tourist attractions, but time spent with family is something that has to be experienced even if it's just sitting around with them spending time and having conversation. Tennessee and the surrounding states have some wonderful sites to see. No wonder it's such a popular vacation area. Lee, we do travel a short distance to see our parents. Usually, we like to go up for the day and return home. It's totally doable, but it makes for a long, tiring day. We joined my folks on Saturday for the 56th wedding anniversary in the town they got married, two and half hours from us, and that was really nice to do. My ideal of vacationing is going to a place where you have to stay in hotel or even with a friend who lives more than four hours away like we did a few years ago when we went to Florida. That was like a mini-vacation for us and we had a blast! BTW, we've been to the Field of Woods a few times over the years. It wasn't long ago that we mentioned needing to go back. Maybe when the weather cools off some, we can take a day trip back over there. I have no clue what your BoTB song is going to be, but I'll be back to check it out on Thursday. Thanks for sharing your lovely family with us. Your kiddies are a long way off. That's gotta be hard some days, huh? Have a good evening! Cathy, Fields of the Wood would probably be a very nice fall trip when the leaves are turning and it's cool enough to stroll about and read everything in the displays. It is nice to see your family and such a large one at that:) we travelled this summer to Quebec...an hour south of Montreal to visit my hubby's aunt who lives right on the Richelieu River. I have travelled to Ann Arbor to visit family and I have travelled to Brixen, Italy to visit my Aunt and Graz, Austria to visit my Cousin and my Aunt...Tante Ilse. Thankfully I saw her in 2009 because she passed away in 2014. I love Europe and will always try to travel there because I feel at home strangely enough. I have no idea what your song choice will be. The only song that came into my head was "long beautiful hair..."
Birgit, I'd like to visit Europe, but I don't see that trip in this lifetime. Not as long as trips to see family are the priority. "long beautiful hair" might fit into the lyrics of the song I've chosen, but I'm not sure. Most of my family live only a 4 hour drive away. Still, I can't go visit very often because it drives me nuts. They are late to everything. Most of my time is spent doing nothing, waiting on them, which isn't fun for me. You plan for a 2 hour dinner at 6 and then hit up the drive-in movies at 9:30... but no one arrives until 8:45, so you have to cancel plans and you've spent 2 hours just waiting. It's frustrating. Lori, I hate waiting so I can understand where you're coming from on this. My time is something I value and if I'm going to waste it I want to waste it for something I want to waste it on. We haven't traveled out of the state of Texas since we landed here on 13 September 2004 (except for the Hurricane Rita evacuation in 2005). Since we have moved here, we have visited more dead relatives than living ones. Most of the living relatives here have been inaccessible to us for one reason or other (mostly attitudes). Anyway...my ideal vacation would be somewhere loaded with history, preferably family history. At the moment, my target destination would be Edgefield, South Carolina. I know that the answers to a lot of my questions are secreted away there somewhere. Suzanne, I like the idea of a "history" vacation. I usually try to absorb as much history as I have time and access to when I'm on vacation. Hope you can eventually make it to Edgefield.